Celebrate yourself and relax while creating a memorable vacation that offers clean, comfortable living with unobstructed, panoramic, breathtaking Caribbean views! OASIS is an Oversized, Professionally Decorated with Custom High-End Furnishings, 2 Bedroom, 2 1/2 Bath Modern, Luxury Condo. Ultra-Comfortable king bed! Desk Area. Flat screen 42" HDTV, DVD Player. Ceiling Fan. Walk-in Closet area with guest safe. En-suite bath with travertine countertops, jetted jacuzzi tub and dual sinks. Separate private commode. 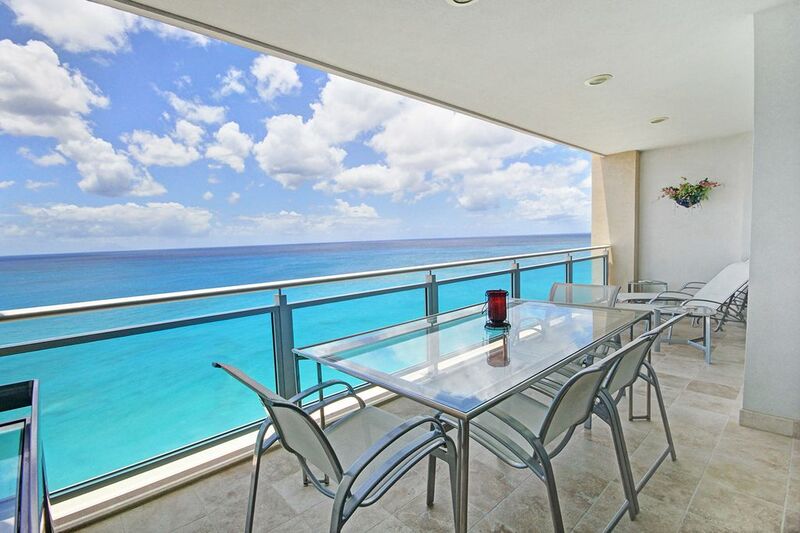 Large glass doors lead to the fully furnished balcony with breathtaking views of Anguilla and Simpson Bay. Of course, hairdryer, flat-iron, and beach towels for your convenience. Extremely comfortable King bed, (we convert to two Singles if needed). Oversized 42' flat screen TV, Blue-ray, DVD Player. Ceiling Fan. Generous closet space. En-suite bath with glass shower and travertine sink and commode. Large glass doors lead to the fully furnished bedroom Balcony. Sit down, and enjoy lovely views of Anguilla and Simpson Bay. Hairdryer and beach towels for your convenience. Fully equipped, gourmet kitchen featuring all the luxuries of home. Granite countertops, upscale stainless appliances including microwave/oven combo, electric stovetop with lighted exhaust hood, full size refrigerator, garbage disposal, garbage compactor, in-sink aerator/disposer, coffee maker, toaster, blender, and complete cooking/eating utensils. The best part...having the stunning Caribbean views while you prepare your meals! Oversized and artistically decorated with fully furnished, private balconies that loom over the unobstructed, direct, panoramic Caribbean Sea! Central air-conditioning (UNLOCKED and NOT time or motion RESTRICTED). Ceiling Fans, Sony 65" Flat Screen HDTV with DVD player, Blu-Ray player, and Bose Sound System. The Bose home stereo system also allows you to stream your music using bluetooth. And of course FREE High Speed, WIFI INTERNET even on the balconies. *FREE use of international Pay-as-you-go cellular phone. Large, stacking washer and dryer with plenty of laundry soap, stain remover, and fabric softener. Large utility sink, iron and ironing board for your use. OASIS@The Cliff, is truly a BRILLIANT choice for anyone looking for a modern, super luxury 'On-The-Sand' style vacation on a private beach, surrounded by a breathtaking views…at a very affordable price! We've been looking for an 'Oasis' for many years. We work very hard all year long (Bestselling author and elementary school teacher), and are so excited to have finally found a very special place to fully and completely relax, reconnect with each other, and build amazing memories together. ON-THE-SAND, Direct, unobstructed, PANORAMIC ocean views, private beach, fantastic fitness center with ocean views. New and modern High Security building. All bathrooms have granite countertops and been professionally decorated. International 'Pay-As-You-Go' cell phone with free incoming calls provided for guest use. Plenty of free secure parking. Reserved parking spot in garage also included. Free Wireless High-Speed Internet. Recently upgraded to 4mbps speed. Fully equipped, including free weights, cardio/yoga room, with Ocean and pool views. Large flat screen TV, Bose stereo sound system, bluetooth connection to stream music from your devises. Full sized, with filtered water and ice in door. Full kitchen just like your home. Fully equipped gourmet kitchen with granite counter tops, double ovens, and stainless appliances. Bose System with Bluetooth music streaming from your devises. Relax to the classics, All Seasons of Seinfeld, Friends, and The Matrix, amongst many others. Front and back, both with amazing water views. Rent boats 10 min. away at Simpson Bay. For your privacy there are separate Sauna's, AND also separate Steam Rooms for guys and gals. Pools are not open to the public, they are for condo owners and guests Only. 2 Swimming Pools, 1 indoor and 1 outdoor. Both heated. 2 Hot tubs. 1 indoor and 1 outdoors. The following are all onsite amenities: 24 Hour professional and friendly, on-staff security, so you can freely relax, GATED and ultra-secure parking, FULL Service Christian Dior Spa, BEACHFRONT living with direct access to sandy beach, 2 STEAM Rooms, 2 SAUNAS, INDOOR and Outdoor Hot tubs, INDOOR two-lane lap pool with spectacular sea views, LIGHTED Tennis Courts, FULLY Equipped Fitness Center with yoga room and spectacular sea views. Wonderful accommodations. What a VIEW! Had a fabulous stay! What a grate complex that has everything you need on site. The owner has everything from beach chairs, coolers, beach toys all for your enjoyment and did I mention the fantastic View! You will not be disappointed. We are looking forward to our next visit. From the desert to The Oasis.....HEAVEN! Just returned to Arizona from 2 weeks at The Oasis and it wasn't enough.This was my wife and my 3rd condo we've rented at The Cliff and our 5th trip to St. Martin so you can tell we love this island and the the beautiful Cliff. Tommy and Pam's condo was the most comfortable and best equipped we've ever had. The kitchen had an ice maker that worked (other condos didn't), sharp chefs knives, pots and pans in EXCELLENT condition, huge rolls of plastic wrap & foil, numerous kitchen towels, drip coffee maker, Ninja blender, storage containers, herbs and spices, plentiful trash bags, paper towels, and cleaning supplies. Both bedrooms had blackout drape liners, hampers, many outlets for computer/chargers, and many hooks on walls near closets. Both baths have magnifying mirrors, hair iron and dryers, baskets filled with extra razors & toothpaste & toothbrushes, shampoo & conditioner.....and the toilet paper....rolls stored everywhere (other condos rationed 1 roll). The laundry room was well supplied and there were beach chairs and umbrella(usable but we used duct tape to try to repair it), inflatables for swimming, a cooler & blue ice, and even hats. We contributed a kite and string. There are binoculars to watch boats, ships, and planes go by the balcony....Tommy has thought of everything and even has a large notebook filled with "anything you need to know" about St. Martin for newbies. I even managed to read his book which is on an end table in the living area. It was a pleasure dealing with him and he was in contact during our vacation trying to make sure we were having a perfect vacation. When we return to our favorite Caribbean Island we'll definitely be staying @the Oasis. Spent almost two weeks at this condo with a family of four and it was excellent. Below are some of the amenities that put this condo over the top but will attempt not to include items previously mentioned from other reviewers (e.e., views, location, attentiveness of owner). 1) Availability of a mobile phone for emergency use when traveling around the island and to make restaurant reservations, which is a must for excellent restaurants. 2) a binocular to watch planes, and cruise ships passing by the condo. 3) Professional chef knives for slicing French baguettes and other ingredients. We ate out almost every night but very handy for snacks and lunches 4) Shampoo, conditioner, body soap, dish washing liquid, washing machine liquid and other basic necessities are readily available so our vacation can immediately start as soon we walk into the condo. 5) Bluetooth Bose speaker system to stream our favorite music from iPhones. 6) VoIP phone to make and receive unlimited calls from the states. 7) Condo is located next to the best beach on the island (i.e., Mullet Bay) but it is open for interpretation of course. We can walk, drive, or swim to Mullet Bay, which we did all three. 8) Great fitness center overlooking the water and it was frequented daily by us. 9) Exclusive elevator which only supports two condos per floor and therefore the wait is minimal and fast. 10) Reserved parking space right next to the elevator to keep the car cool. 11) High ceiling throughout the condo and lobby which made it feel very expansive. Our family felt very comfortable with the condo right from the first day and we highly recommend this condo. We have stayed in other condos in Maho (Blue Marine) and Simpson Bay (Simpson Bay Resort and Spa) but this condo is by far our favorite. Our condo in St. Maarten couldn't have been any better. Tommy made us feel very welcomed and even checked with us several times throughout the week to make sure everything was good. This was truly an oasis when it came to relaxation and unwinding from our busy lives. The condo had everything we needed so that we didn't have any stress. St Maarten is an great place to unwind, or busy enough to keep you going if your the adventurous type. This condo was perfect. Well stocked, clean, great location. The owner was in contact throughout the stay just to make sure things were going well. When you see the 5 star ratings on this place, you can believe it! This condo was absolutely perfect for our stay in St. Maarten! This was my second time on the island and I can't say enough about how wonderful The Cliff is -- the location, the amenities, the condo, the people. The owner, Tommy, was wonderful and checked in on us during our stay to be sure there wasn't anything we needed. He was also helpful in recommending restaurants, car rentals, etc. The condo is well maintained and is exactly as the pictures depict. The pictures of the balcony views don't do it justice -- it's one thing I miss the most from our trip. I hope to be back and to stay here again. E6@The Cliff in Cupecoy, in St. Maarten, is an ideal dream for the traveler looking to either stay put or travel about. No car necessary if you prefer to anchor yourself for an ultimate condo-stay vacation. Our designer styled condo at The Cliff offers luxury and tranquility from simply relaxing on your ocean-front balcony listening to the crashing waves of the Caribbean Sea to spending a 'you' day at the only Caribbean Christian Dior Spa located on site. And if your a health enthusiast, 'keeping fit' has never been more fun when you do it Caribbean stye in the on-site fully equipped fitness center with a yoga room and stunning ocean views! But lets say you want that and more! Well, just a few steps away you can find yourself playing poker at the Alantis World Casino, quoted as the St Maarten's 'best casino.' Or take a short, leisurely stroll and find yourself at the island's world famous white sand beach, Mullet Bay. Want even more? Rent a car and explore the islands diverse land/water activities, jamming nightlife and restaurants, or do some serious hiking with majestic views at Loterie Farm 'hidden forest' of nature preserves. You might even spot a monkey or two!